An earworm of worry wriggles into your head before your feet even hit the floor. You spill your hot coffee, which means you have to change, which means you’re running late, which means you’ll get fired, which means you’ll be homeless, which means you’ll starve, which means…your anxiety is winning. Try these three quick and simple meditation techniques for anxiety to reclaim your power over your throbbing brain. By investing three minutes of your time and focus, you can set a tone of peace and competence for the rest of your day. 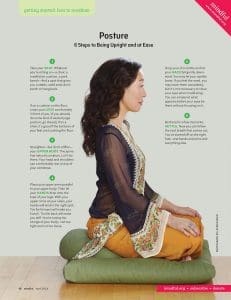 Close your eyes, place your hands on your stomach and breathe slowly and deeply, feeling the expansion and contraction in your belly with each breath. In only sixty seconds, by focusing on your breath patterns, you are snapping your brain back into the present moment. Continue your deep belly breathing. Now visualize your worries as dandelion fluff. With each breath, you blow them away on the wind. Psychology Today reports that the human brain barely distinguishes between thought and action, which means that by visualizing yourself expelling your worries, you are literally creating calm. What is it? Anything you’re obsessing about. Spend another minute adding a simple mantra to your breath pattern – I got this – because you do! You’ve survived every single thing you’ve worried about in your life up until this point; odds are, you can handle anything that today is going to throw your way. By incorporating these techniques into your morning routine, you’re taking powerful steps toward managing your anxiety naturally. Visit our website for more exercises in mindfulness or contact us if you have tips of your own to share. Find more exercises related to mindfulness based stress reduction here.